The Medmerry Managed Realignment Scheme is being showcased at the International Union for Conservation of Nature (IUCN) World Conservation Congress, which is taking place in Hawaii this week (w/c 5 Sept). Held every four years, the Congress brings together several thousand leaders and decision-makers from government, civil society, business and academia to help shape the future direction of conservation and sustainable development. Delegates will hear how Medmerry’s innovative design was based around the latest thinking on natural flood management techniques, and how it also incorporated four miles (seven km) of new sea embankments. They will also hear how the scheme has significantly reduced coastal flood risk to hundreds of local properties as well as protecting the key infrastructure for the town of Selsey in West Sussex. 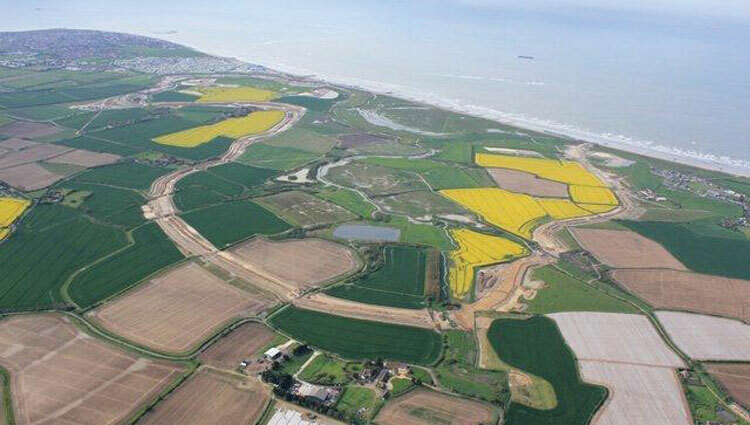 The Medmerry Managed Realignment Scheme was delivered by Team Van Oord on behalf of the Environment Agency, and includes the largest managed realignment of open coast in the UK. The scheme also created a new wetland for local wildlife with 183 hectares of intertidal coastal habitat for wading birds and potentially endangered species, including the water vole. Much of the site is now managed by the RSPB as a nature reserve. As a result, it has helped the rare British wildlife to flourish. In May, it was confirmed Avocets are breeding at the site for the third consecutive year since the scheme was completed in November 2013. This new form of defence has helped save £300,000 of taxpayers’ money each year (the cost of constantly repairing/maintaining the shingle bank during the winter months), and also supports local economic growth by allowing businesses to operate all year round, and encouraging ‘green’ tourism. As well as being presented as a case study for nature-based solutions, the multi-award winning scheme has also been selected to form part of the IUCN 2016 report.